Two of President Trump's agencies are sending mixed messages about the regulation of media and telecommunications companies. 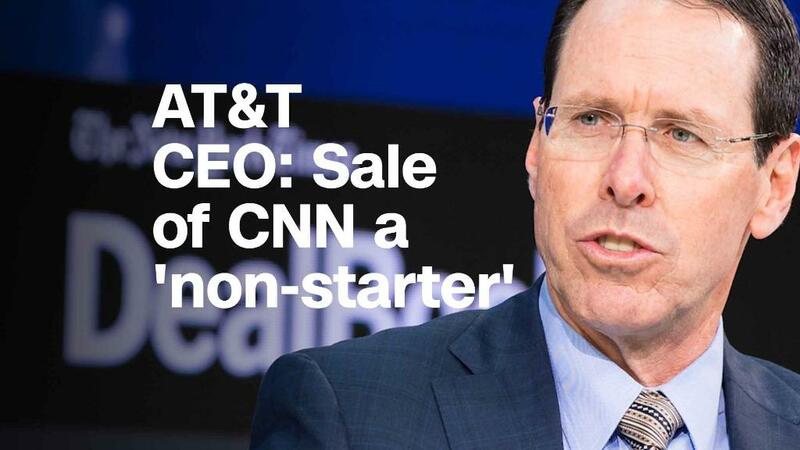 On Monday, the Justice Department sued to block a mega-deal between AT&T (T) and Time Warner (TWX), CNN's parent company. The agency argues the deal would give AT&T too much power to harm competition for video distributors, including online video services. Then on Tuesday, the Federal Communications Commission announced plans to repeal net neutrality protections. The Obama-era rules were intended to ensure that internet and wireless service providers -- like AT&T -- can't handicap or favor certain online services. The result: One government agency is trying to rein in a telecom company, in part to protect the competitive landscape online. And another is planning to undo rules designed to keep telecoms in check, potentially upending the competitive landscape online. Trump himself came out publicly against the AT&T Time Warner deal on Tuesday. "I'm not going to get involved in litigation but personally I've always felt that was a deal that's not good for the country," he said to reporters. "I think the pricing is going to go up. I don't think that's a deal that's good for the country. But I'm not going to get involved in litigation." Separately, the FCC last week paved the way for greater media consolidation in local markets by doing away with longstanding ownership restrictions -- just days before the Justice Department filed a lawsuit to prevent greater media consolidation. "There is definitely a huge disconnect," says Gigi Sohn, a counselor to former FCC chairman Tom Wheeler, who ran the agency under President Barack Obama when it approved the net neutrality rules in 2015. The FCC did not review the AT&T deal because no FCC licenses would change hands. Although it's not entirely apples to apples, Sohn says there's "definitely overlap" between the Justice Department's argument to block the merger and the argument for net neutrality, particularly when it comes to online video. Makan Delrahim, the Justice Department's antitrust chief, argued in a statement that AT&T could "impede disruptive competition from online video distributors" that threaten its business by charging rival services more for Time Warner shows and movies, or simply withholding access to that content. That could make it harder for the next Netflix (NFLX) to compete. Net neutrality advocates, meanwhile, argued that providers like AT&T shouldn't be able to prioritize their own content over rivals by loading it faster or serving it more cheaply, nor should they be able to charge a service like Netflix more money to get its content into a so-called "fast lane." In both cases, Sohn says, it boils down to a concern that content distributors -- in this case AT&T -- should not be able to "pick and choose who wins and loses." The Justice Department and the FCC declined to comment. A government official close to the Justice Department stressed that the two agencies "operate under different statutory mandates." "There are considerable inconsistencies, even though the issues are based on different areas of U.S. law," says Craig Aaron, president and CEO of Free Press, a nonpartisan group that advocates press freedom and a fair internet. The stark difference in approach by the two agencies was perhaps most apparent in the reaction from consumer advocacy groups. Organizations like Free Press have spent much of this year publicly attacking the FCC and its chairman, Ajit Pai, for not doing enough to protect consumers. The group helped organize a major protest to defend net neutrality and criticized Pai for paving the way for media conglomerates. But on Monday, the group turned into a cheerleader for the Justice Department, praising the antitrust lawsuit as "refreshing." "Ajit Pai might have something to learn from the career lawyers at the DOJ," Aaron told CNNMoney. Gene Kimmelman, president and CEO of Public Knowledge, another advocacy group for an open internet and access to affordable communication tools, echoed the sentiment. "One agency is forcefully doing its duty enforcing the law thoroughly and carefully," he said. "The other agency is being much more lax and favorable to the dominant internet service providers and should be doing more."